I have been using AutoCAD since release 10 and it never ceases to amaze me that no matter how much I know about AutoCAD, there is always so much more that I don't know about it. Example, I was working with the Action Recorder today in AutoCAD 2009 (I'm a beta tester and have a pre-release copy to test) trying to set up a macro that offsets objects a certain distances. I have always done this, offset to a specific distance. I did not know that you could offset to a specific point!!! Instead of entering a distance to offset, use the THROUGH option. The place were you pick is where it will go!! No, this isn't a post about dogs at Autodesk. It is about a great website from Autodesk. they have set up a site where users can go and look at, comment on, and participate in new software, programs, add ons, and more that are in development by Autodesk. Autodesk Labs has produced Impression and other applications and utilities that many of use use today. They are currently testing an Inventor LT!!! Sound interesting to you? they also have Project Draw, which is an online sketching application. Files created in Project Draw can be saved online. Some of the Labs biggest items right now include Project Freewheel, which provides a free service that allows users to upload DWF or DWFx files to a server for other people to view. This means that if you have a client that does not know how to open a DWF file, just upload your dwf and send them the link via e-mail. All they have to do is click the link and here comes the file. they can pan, zoom, rotate, and print all they want or need. Plus it keeps your digital data safe. Another big ticket item is Visual Search. This one is cool. With this online utility, a user can search for a particular part or item with visual data. If you know what you need but don't know the name, draw "doodle" in the free hand mode. If you have an image or a drawing, upload that and search that way. One other item is the Project Showroom. This is an online utility that is basically researching how online users navigate in a 3D realm. A user sets up an area with options. If the area is a room in a house that needs decorating, designs, furniture, etc, then those items have options. the user will select an item, like a sofa, chair, wallpaper design, etc, an chose a desired option. The display then changes to reflect the choice of the user while providing information on that choice. it can be used as a simple designing feature or preview feature that demonstrates how a room would look if certain items are chosen. Another cool feature in the labs. If you want to stay up to date with some of the latest gadgets coming out of Autodesk, visit their lab. Just look around, post to their discussion boards, or try out the gizmo's. 100 Hits in One DAY!!! I know that isn't much to brag about in the real world, but in my world, where I have a total of 700 ~ hits total for my blog, that's a big deal. I have to say that today's traffic came from a link to my blog from the website Ten Links Daily by Roopinder Tara. Thanks. Ten Links Daily linked to my blog from February 25, that was on AutoCAD 2009's Action recorder. Ten Links Daily sends out daily e-mails and weekly e-mails with many (much more than ten) links to CAD related articles on the web. I would recommend signing up or at least visiting their site regularly, especially if they provide links to my blog!! I posted earlier about AutoCAD 2009’s RIBBON. But my favorite new feature is the ACTION RECORDER. The ACTION RECORDER is essentially a macro recorder similar to what is in the Microsoft Office products, and other programs. In a nutshell, it will “record” what the user inputs. Why would anyone want to do this? In order to complete repetitive tasks. If a user finds him or herself doing the same thing, taking the same steps, or plainly doing the exact same thing over and over again, the action recorder could help out. My first response to this was, WOW!! That's cool. But then I couldn't figure out when I would ever do the exact same thing, exactly the same, every time. Good point. The actions that are recorded have the ability to be altered, or customized, later on. But for now, lets stick with the basics. 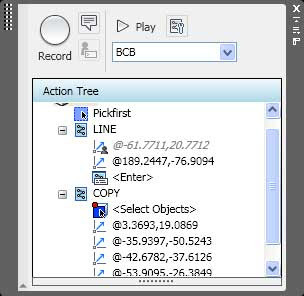 Go to the action recorder, it is found in the ribbon under the TOOLS section (default 2009 settings of course as the ribbon can be customized.) Get ready to draw, then press the RECORD button on the AR (AR is short for action recorder, because I am too lazy to type out Action Recorder every time-perhaps this would be a great use of the Action Recorder, if I was typing this in AutoCAD). As soon as the AR is started, it will keep a record of every action the user takes, ans save them in a file to be used later. This is great because these AR files are now easily shared. It is a form of code writing, well, not really, but it is in a way. it is by no means a replacement for LISP or script files, but it is an additional tool for users. When the user finishes the task at hand, simply press the STOP button on the recorder. A menu pops up asking for a file name, etc. AR files are very similar to script files, but a little more advanced. While LISP files are more advanced in abilities than AR files. When should an AR file be created and used? If there are actions taken to every day in a users job, then consider using the AR. If a project requires repetitive action, then consider using the AR. If there is something that needs doing today over many drawings, then consider using the Action Recorder. Here is an example: I had to edit a title block, legend, and notes the exact same way on about six different drawings a few days ago. I used the AR. Each change was the same on each drawing so it worked out great. I made the change once, then opened the other five drawings and ran the AR file that I created. Done. What would have taken me 45 minutes took my about 15. I saved thirty minutes and wowed my supervisor! The action recorder does have some limits that we need to keep in mind. 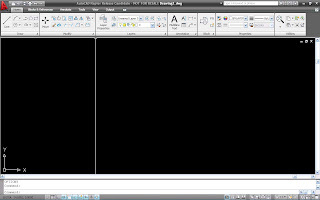 The AR can only record actions that take place with the properties palette, the quick properties panel (new feature in AutoCAD 2009 that I will get into later-essentially it is a smaller version of the properties palette that pops up quickly to show the user some basic info on an item that is selected), the Layer Manager and the command line. It can not record what happens in a dialog box or tool palettes. There is a way around that, simply type in the commands needed rather than use the dialog box. Do that by entering a DASH (-) in front of a command. It will not open a window, but provide you with options in the command line. I know that this is very old-school, but the action recorder works with code, not graphics. It can not understand LISP or ObjectARX commands either. Sorry. One other thing to keep in mind is the AR file naming procedures. If an AR file is created and called CIRCLE, it will not work because there is a default AutoCAD command that is CIRCLE. However, if the AR file is named C, it will work. In the command hierarchy , AutoCAD commands rule, then Action Recorder Commands, then everyone else. Yes, if there is an AR command that is named the same as a LISP routine, the Action Recorder wins. I'm not sure if a LISP beats a command alias, I'd have to try that out. These files can be saved and shared. Nice. There are settings in the options for the default folders when created an AR file and for reading the location of an AR file. Where these folders are are up to the user. I recommend (until I find otherwise) to save the AR files to your local machine, but set up a folder on a companies network for company approved Action Recorder files. Some sort of new CAD Manager Action Recorder Oversight Committee will have to determine the best practices for a company to use. If you need to create the same layers every time just before you insert a block and then edit it the same way, every time, then use the Action Recorder. If that info that goes in to the block is different, then there is way to tell the AR file to pause for user input. After the AR file is created, open it in the Action Recorder. There are two editing options, pause for user input, and insert a message to the user. You can leave your coworkers a nice message about your self, or on how much you enjoy working with them, etc. BUT, if the action required is to insert a bolt hole, every time, on a certain layer, but the size of the hole could be different every time, or the relative location is different every time, then you would want the AR file to pause and ask the user, How big do you want this hole? or Where do you want this hole, or both. That's it in a nutshell. There is of course a little more to it, but you are tired of reading this much already. Book mark this post for future use when you finally get your copy of AutoCAD 2009, or oneof its verticals. The Back of My Head!! I'm in the picture, top left area, but all you can see is the back of my head. Lynn is up front, very tinny in the picture. That's right, I was privileged to meet and speak with AutoDesk's Technical Evangelist, Lynn Allen. We, the South West Florida AutoCAD Professionals, my LUG (Local User Group) had our monthly meeting and the presenter was Lynn Allen. She went over AutoCAD 2009 and all of the great things that it has to offer us. I've been beta testing 2009 for Autodesk since last year so I was pretty familiar with what was being covered. However, it was great to see other people's reactions. If you get the opportunity to hear Lynn speak, I recommend that you do it. She is a dynamic speaker. and other stuff . . . . I am going to try and cover these items in my next blogs. The main change to 2009 is the interface. AutoDesk has made many small improvements to the way we work that will quicken your drawing pace. One example will be the ability to GRIP EDIT X-CLIPPING. You know how to x-clip an xref, you know how to grip edit a line/text/object, put the two together and BAM!! Grip editing X-clips. Ok, x-clip an object, keep the boundary there. Then select that x-clip boundary, see the grips in the polyline? Click on one and drag it, your x-ref is re-clipped!! We no longer have to delete the current x-clip and draw in a new one, just move the grip. You can still do it the old way, but why? I know how annoying it can be to have to go to a website or blog to see if anything has changed, been added, or deleted, etc. Many times you can't tell if it did or didn't. With that in mind, I have added an RSS feed to CADaBlog. This means that it is very easy for the readers to know when a new post has been added. There are two ways to sign up: 1) Through an RSS feed, 2) via e-mail. If you use an RSS reader then I recommend that. It keeps your e-mail in box clean, plus it is easy to get to the post. If you don't use an RSS reader, then e-mail alerts work great too. When ever a new post is up, you will get an e-mail notification. To sign up, look at the top right of this blog and click on the method you wish to use. Or just click here at the bottom of this post. thanks for coming by, and happy CADing. AutoDesk's Impression is now "FREE"!!! Impression will no longer be sold as a stand-alone application. Impression 2 will be available to Subscription customers of AutoCAD, AutoCAD Architecture, AutoCAD Civil 3D, AutoCAD Map 3D, AutoCAD MEP, and AutoCAD Revit Architecture Suite. This means that anyone on Subscription will now be able to download Impression 2 and use it. Those users not on subscription, well, sorry. It is no longer available. Autodesk has made this move for two reasons; 1) Sweeten the pot that is Subscription, 2) An attempt to get Impression to more people. As a beta tester of Impression 1 and 2, I recommend using it. Who can use it? Anyone that has design data that could be shown visually. Landscape Architects, civil engineers, architects, mechanical designers, electricians, etc. If a drawing is made then Impression can enhance it visually. If you are the type that is "not creative" so what, try it out. i think you will like it. I am currently going back to school. One of my required classes was biology. I worked with a few of my class mates on a project about respiration, so we needed a colored drawing of a plant cell, in cross section. I drew it in Impression!!! I wonder if AutoDesk ever considered biology homework to be an application for Impression? How to win a Cubical War!!!! Ok, I have taken part in, and been the victim of, many a cubical war varying in complication and vileness, BUT I have never been involved with one this expensive, this complex, this elaborate, or this good!!! This is a must see video for anyone that works, or has worked, in a cubical. Well, it's that time of year again. AutoDesk is starting up the fanfare, getting out the press releases because March is around the corner. The good news is that I will have plenty to post about for a while. As you can see, there are no tool bars and the pull down menus are gone. In there place is the RIBBON. If you have used Microsoft Office 2007 then you will be familiar with the ribbon concept. AutoCAD's ribbon works virtually the same, except that it can be customized. It can be collapsed, docked, undocked, the tabs moved around and more. The dashboard is completely gone. If DASHBOARD is typed in at the command line the ribbon will turn on. It isn't even listed as a topic in help! The poor dashboard was only here for two releases. The ribbon is really the dashboard, but on steroids. Autodesk chose to call it the ribbon to keep a familiarity between different software packages. Out of the box, there are six groups of TABS to choose from. These work similarly to the pull down menus of old. Each group has different tabs, which act like tool bars. The ribbon is collapseable, and the tabs have fly outs. Each tab can be pulled out and placed anywhere on the screen (just like toolbars.) They can be put back too. Users can create new tabs or modify any existing tab through the CUI. To allow for more screen realestate, the ribbon can be minimized. The groups and tabs can be accessed by hovering the cursor over the desired group or tab. It can also be undocked and placed either horizontally or vertically any where on the screen. If two monitors are being used (like me) then the ribbon can be put on either screen. The ribbon takes some getting used to, especially for those that have customized their menus, or for those that live for toolbars. After a while users seem to get used to the ribbon . The next post will take a look at the MENU BROWSER, and the big red A. Wonder Why you are passed over for Promotions? Salary Increase? or missed that New Job? You will become like those to whom you Associate ! ADDA is the Answer ! Don't Hesitate to set yourself APART ! Lynn Alan is coming to South West Florida!! The local user group, South West Florida AutoCAD Professionals will be sponsoring Lynn so that she can speak to us about the new and exciting additions to AutoCAD. If you can make it please come and learn. Get a jump start on everyone else in the area. AutoDesk 2009 Releases - Coming Soon! AutoDesk has begun announcing their 2009 line up. 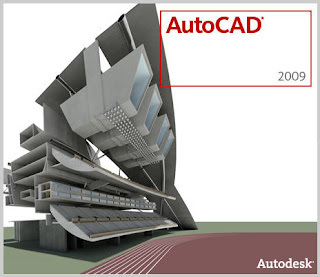 I will begin blogging about some of the new and or enhanced features coming our way in AutoCAD 2009 and in Impression 2. Come back soon to start seeing the future!!! The hatching abilities of AutoCAD have come a long way sense I started with Release 10. Here is a quick tip for "redoing" hatches in release 2008. I came across an unassociated hatch who's boundary had changed. There was a gap between the line and were the hatching ended. In the "old days" I would delete the hatch and create a new one. Not any more. I opened the Hatch Editor, selected the hatch pattern, then clicked the "REMOVE BOUNDARIES" button. The screen highlights the boundaries of the selected hatch and instructs you to select the desired boundaries. Click the boundaries you want to remove. You can keep selecting as long as you want to. Then, right click to ADD BOUNDARIES. The default setting is to "SELECT AREA" to hatch, but there are other choices too: select objects or remove boundaries. Either pick inside the area to rehatch, or select the object you want to hatch to. When done, right click or hit enter, then OK.
You have rehatched your hatch. In some cases it might be easier to delete the hatch then recreate it, but using this method allows you to keep the layer and pattern settings for the hatch. Autodesk has announced the dates for Autodesk University 2008. Have you ever had the need to select an object in AutoCAD that was "underneath" another object? There is a way to toggle overlapping objects. Start your command, then start picking objects. When you come to the overlapping objects, place your cursor over the object, press and hold the "SHIFT" key while pressing the space bar. While holding the SHIFT key down, press and release the space bar to "toggle" through the overlapping objects until the one you want is highlighted. Presto!! You can pick the proper object.